Bug or feature? That is my question. 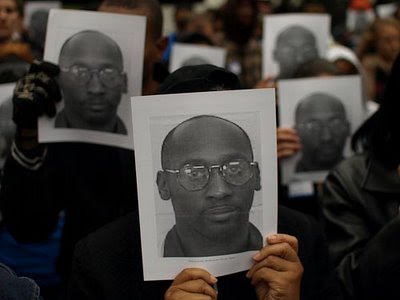 Is the imminent state-sponsored murder of Troy Davis a travesty of justice, or is it the way our system of justice is intended to work? Can I say for sure that Davis is innocent? No, I cannot prove a negative. No one can. But the State surely has not met the "beyond a reasonable doubt" threshold. Let's set aside the loathsome judicial and penal officials in Georgia. They are beneath contempt. I have to say that the comments by the family whose loved one Mr. Davis did not murder are chilling. They run something like this: '"He" stole our future; regardless of whether we or anyone else might prove that. We don't care whether he did it or not, we want closure and peace. And that will come when someone, anyone, else dies.' There is a reason why we disallow people from being judges in their own case. In this instance tragedy has made these people smaller. The justice system is serving as enabler of that psychological withering. Hope they enjoy their Closure Celebration.